A new study into Armenian genetics reveals that present day Armenians are a mixture of local Bronze Age people who have retained homogeneity for over three thousand years, and show great affinity to Neolithic Europeans. Armenians are an ethno-linguistic-religious group distinct from their surrounding neighbors. They have their own church, the Armenian Apostolic Church, which was founded in the 1st century CE, and became in 301 CE the first branch of Christianity to become a state religion. 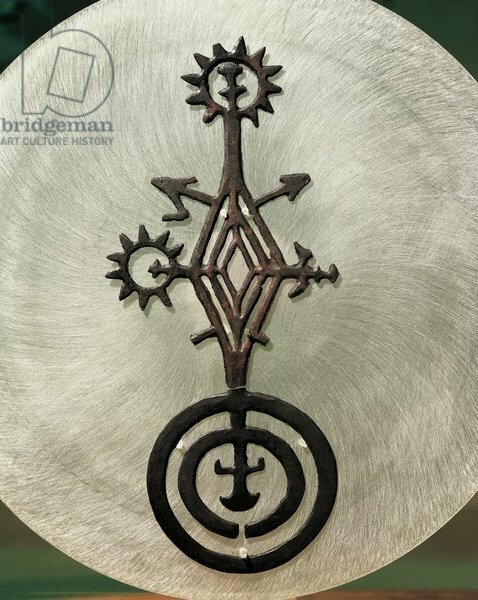 They have also their own alphabet and language which is classified as an independent branch of the Indo-European language family. The historical homeland of the Armenians sits north of the Fertile Crescent, a region of substantial importance to modern human evolution. Genetic and archaeological data suggest farmers expanding from this region during the Neolithic populated Europe and interacted/admixed with pre-existing huntergatherer populations. Furthermore, Armenia’s location may have been important for the spread of Indo-European languages, since it is believed to encompass or be close to the Proto-Indo-European homeland (Anatolia or Pontic Steppe) from which the Indo-Europeans and their culture spread to Western Europe, Central Asia and India. 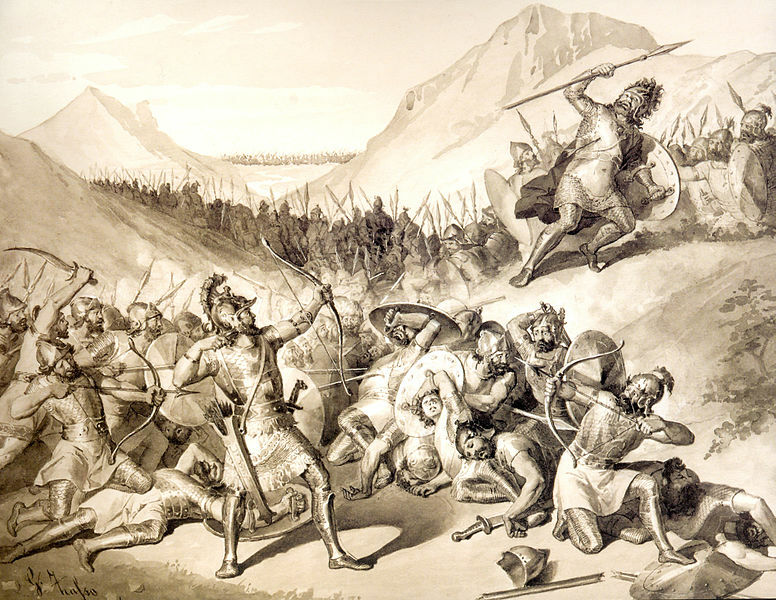 Bel tried to impose his tyranny upon Hayk’s people. But proud Hayk refused to submit to Bel. As soon as his son Aramaneak was born, Hayk rose up and led his people back into his ancestral land of Ararad. At the foot of the mountain he built a village and called it with his name “Haykashen”. Gold jeweler from the Bronze Age Armenian burial site Nerkin Naver. thus describes the medieval Armenian chronicler Movses Khorenatsi (ca. 410–490s AD) the legendary founding of the Armenian nation, dating it to 2,492 BCE. While the legend remains unattested the dating of the foundation of the Armenian nation seems to have gained credibility from a recent genetic study. The Armenians show signatures of an origin from mixture of diverse populations occurring 3,000 to 2,000 BCE. 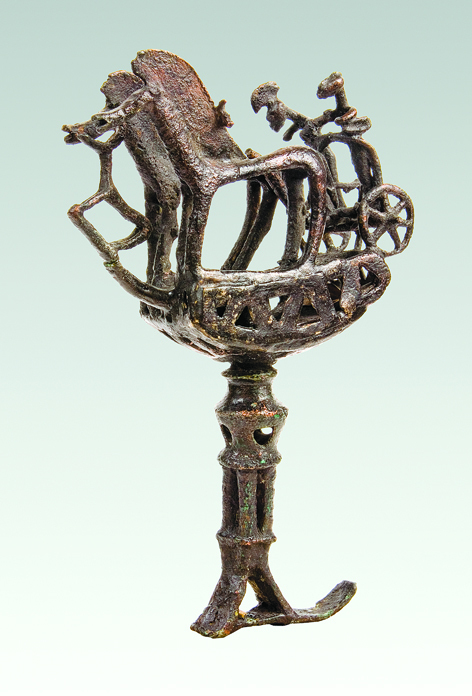 This period spans the Bronze Age, characterized by extensive use of metals in farming tools, chariots and weapons, accompanied by development of the earliest writing systems and the establishment of trade routes and commerce. 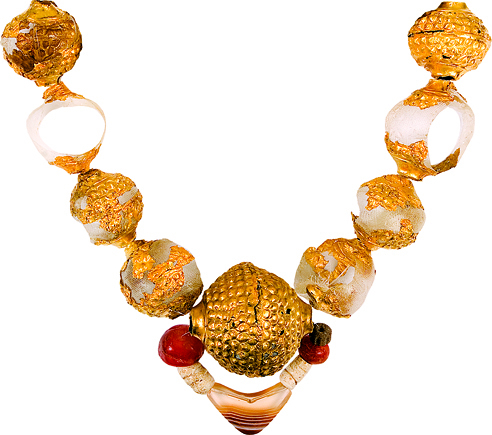 We note that these mixture dates also coincide with the legendary establishment of Armenia in 2,492 BCE. Armenian admixture events: Each horizontal coloured line indicates an admixture event and its width reflects the estimated date of admixture. 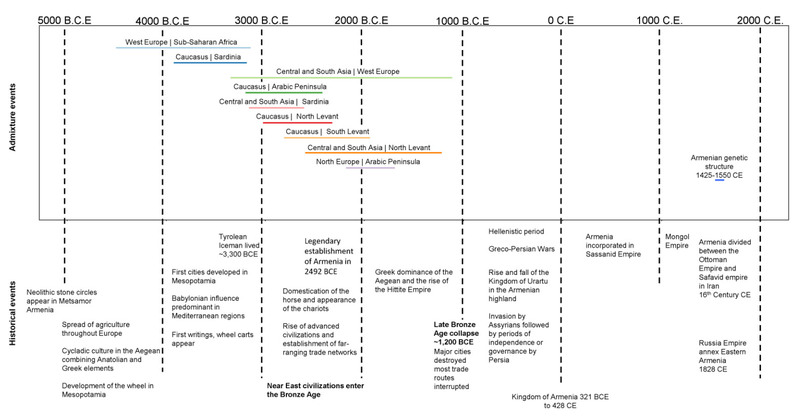 Major historical events and cultural developments in the Near East are at the bottom. Our tests suggest that Armenians had no significant mixture with other populations in their recent history and have thus been genetically isolated since the end of the Bronze Age, 3,000 years ago. The middle Bronze Age saw an increase in herding and animal cultivation. 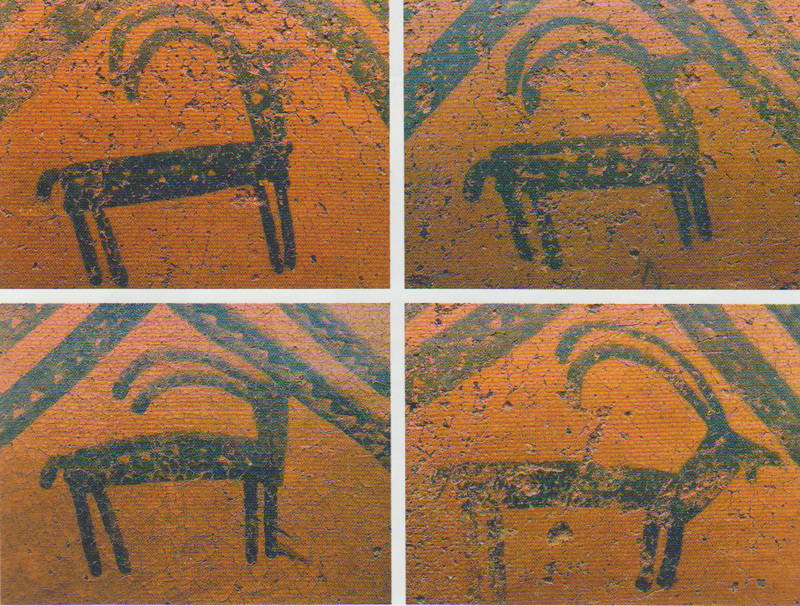 These illustrations found on some of the superb pottery in the Nerkin Naver barrow are presumably goats. The authors explain the cessation of Armenian admixture as resulting from a collapse of Bronze Age civilizations coupled with a development of Armenian cultural distinctiveness. Admixture signals decrease to insignificant levels after 1,200 BCE, a time when Bronze Age civilizations in the eastern Mediterranean world suddenly collapsed, with major cities being destroyed or abandoned and most trade routes disrupted. This appears to have caused Armenians’ isolation from their surroundings, subsequently sustained by the cultural/linguistic/religious distinctiveness that persists until today. Armenians’ adoption of a distinctive culture early in their history resulted in their genetic isolation from their surroundings. Their genetic resemblance today to other genetic isolates in the Near East, but not to most other Near Easterners, suggests that recent admixture has changed the genetic landscape in most populations in the region. 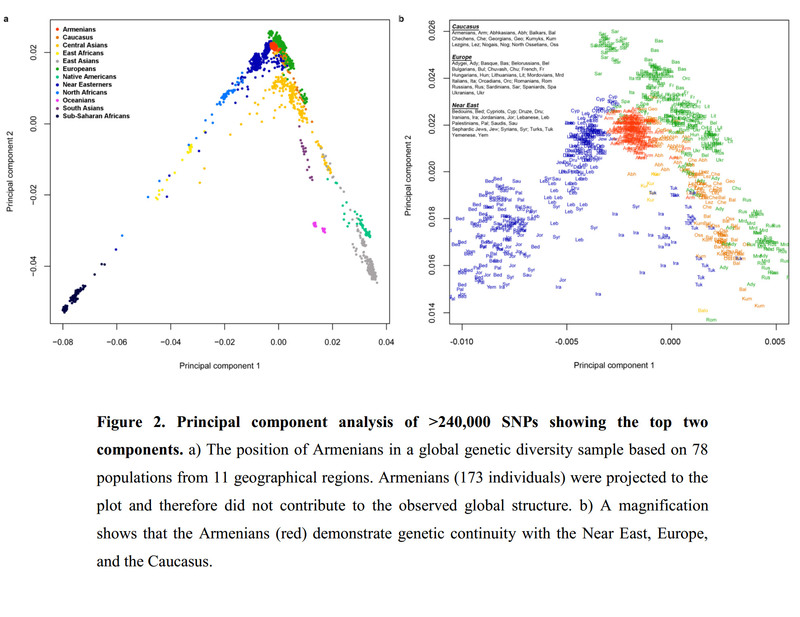 We compared patterns of admixture in Armenians to other regional populations and detected signals of recent admixture in most other populations. For example, we find 7.9% (±0.4) East Asian ancestry in Turks from admixture occurring 800 (±170) years ago coinciding with the arrival of the Seljuk Turks in Anatolia from their homelands near the Aral Sea. We also detect sub-Saharan African gene flow 850 (±85) years ago in Syrians, Palestinians and Jordanians, consistent with previous reports on recent gene flow from Africans to Levantine populations after the Arab expansions. The position of the Armenians within the global genetic diversity is unique and appears to mirror the geographical location of Anatolia. 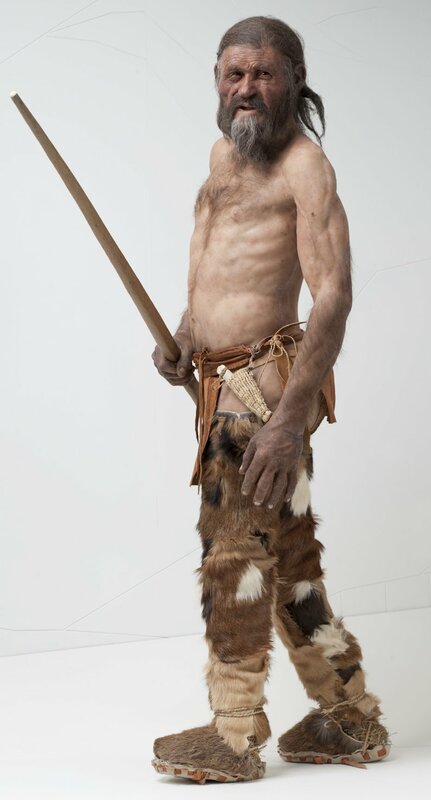 Previous genetic studies have generally used Turks as representatives of ancient Anatolians. Our results show that Turks are genetically shifted towards Central Asians, a pattern consistent with a history of mixture with populations from this region. These results seem to corroborate with previous studies (Hellenthal et. al., 2014) which also didn’t find admixture with Armenians for the past 3 to 4 thousand years. The Armenian Highlands and Anatolia form a bridge connecting Europe, the Near East and the Caucasus. Anatolia’s location and history have placed it at the centre of several modern human expansions in Eurasia: it has been inhabited continuously since at least the early Upper Palaeolithic, and has the oldest known monumental complex built by huntergatherers in the 10th millennium BCE (Armenian Portasar commonly known as Göbekli Tepe). It is believed to have been the origin and/or route for migrating Near Eastern farmers towards Europe during the Neolithic, and has also played a major role in the dispersal of the Indo-European languages. Armenia’s location at the northern tip of the Near East suggests a plausible relationship to the expanding Neolithic farmers. We show that Armenians have higher genetic affinity to Neolithic Europeans than other present-day Near Easterners, and that 29% of the Armenian ancestry may originate from an ancestral population best represented by Neolithic Europeans. We find in Armenians and other genetic isolates in the Near East high shared ancestry with ancient European farmers with ancestry proportions similar to presentday Europeans but not to present-day Near Easterners… Our tests show that most of the Near East genetic isolates ancestry shared with Europeans can be attributed to expansion after the Neolithic period. These results suggest that the Armenians (the genetic isolates in the Near East) probably retain features of an ancient genetic landscape in the Near East that had more affinity to Europe than most of the present day Near Eastern populations do. The long period of genetic isolation makes Armenians in particular unique to the region. The study of the Armenian DNA is therefore very interesting to scholars who study European DNA, because to them Armenians are like an image of what the DNA groups were before they started spreading out.